It’s the start of a new year, and just as tradition goes, our old blog designs must be out so that fresh, new ones can come in. And although what really matter the most are the content and quality of a blog, visual appeal should not necessarily take a backseat. After all, what the eyes see usually has a big say about what the mouth wants to eat! With its sleek, minimalist, and modern design, you can be sure that your web design will just be the cherry on top, and your content will still be the main course. 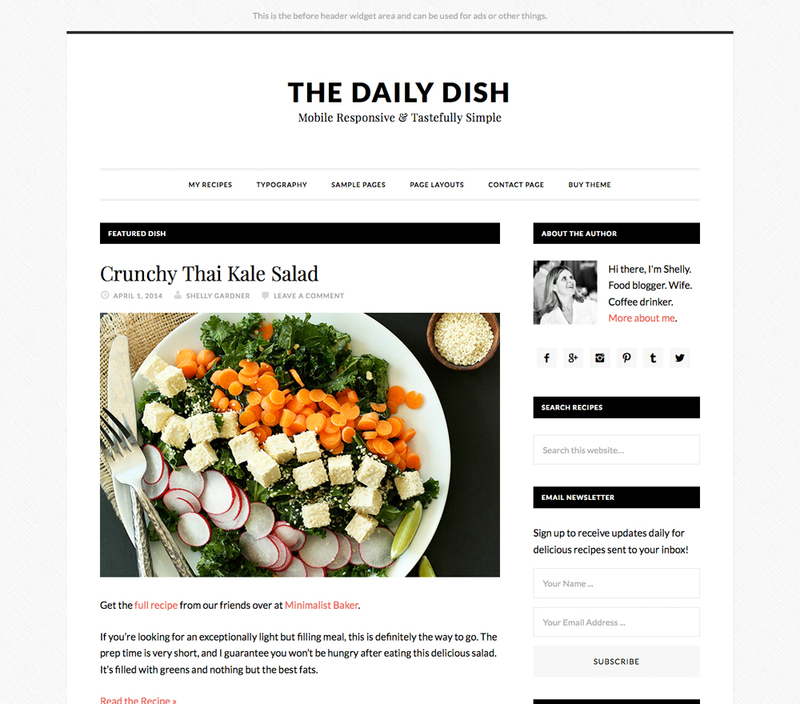 This no-fuss, functional theme will give your blog just what it needs without taking away the spotlight for itself. 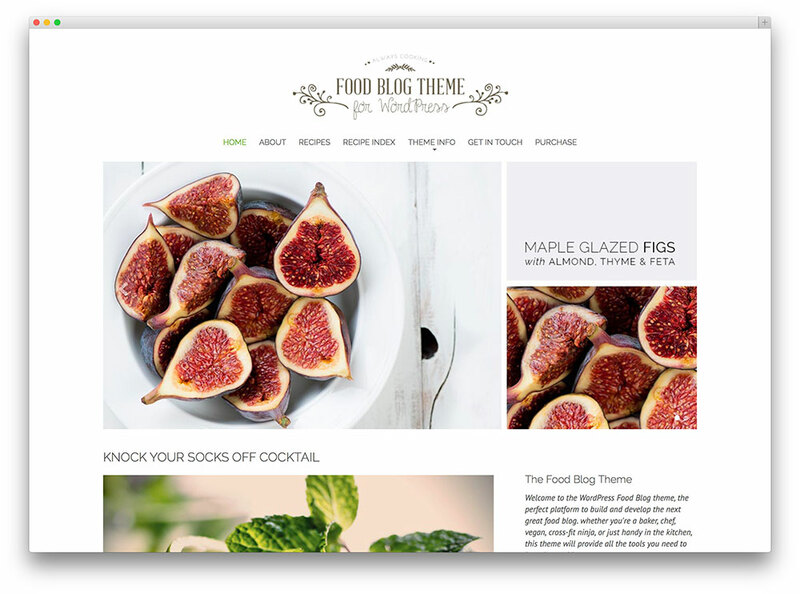 If you’re looking for a theme that provides nothing more than a neat frame for all your gorgeous photos and engaging content, FoodBlog is your best bet. Its minimalist design not only serves as a great avenue for food and recipe entries, it’s also packed with built-in SEO features that will help you get the exposure you need. 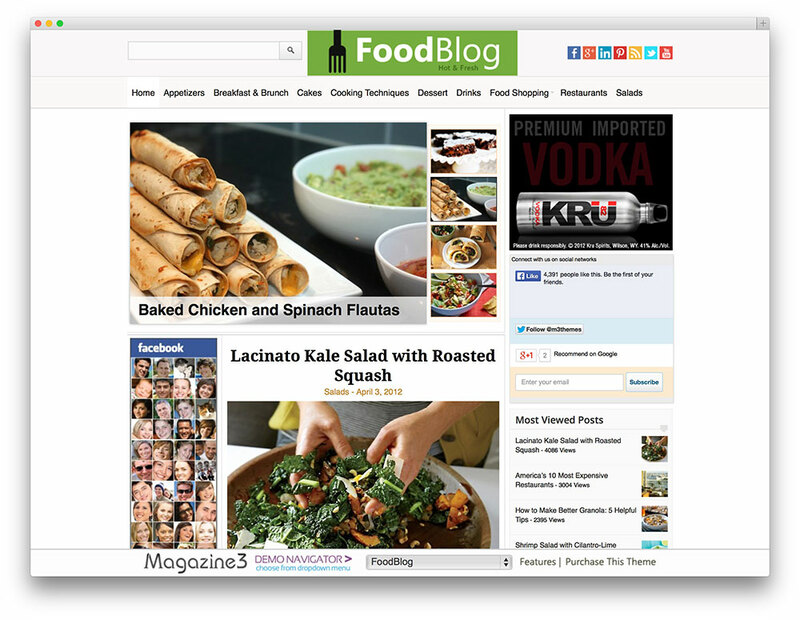 Contrary to what the name suggests, FoodBlog does not exclusively work for food-related blogs, it’s also a great theme to apply to other non-food magazine and blogging sites. 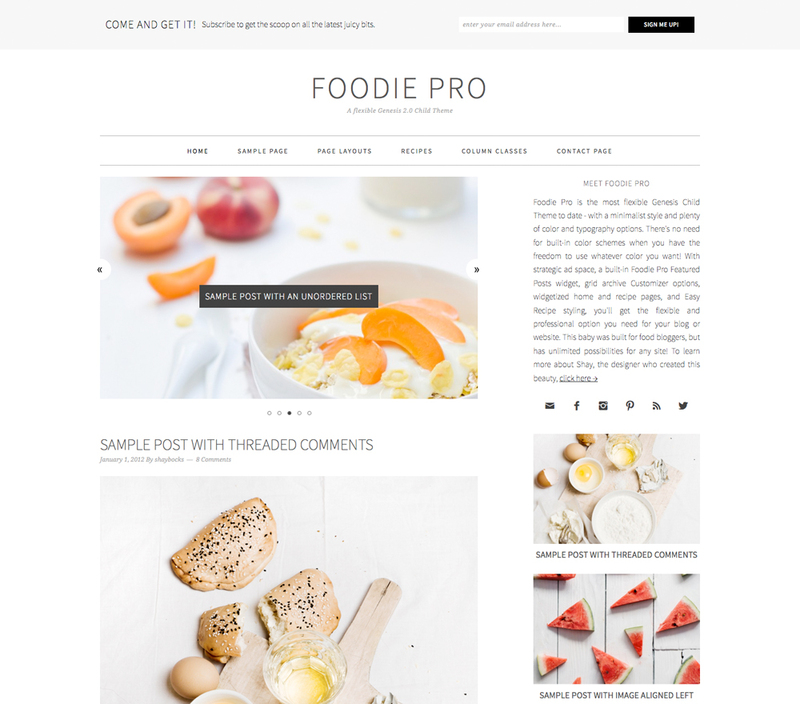 This clean and dainty blog is a perfect theme to start with for those who are still learning the ropes in food blogging. Developed on the Bootstrap 3.x framework, it’s a wonderful theme to work on especially if you’re targeting mobile audience in particular. On top of that, The Food Blog theme also has an integrated, highly functional recipe builder plugin that will allow quick and easy content creation. Sweet! This delicate, minimalist theme may look like it doesn’t have a lot going on, but you’ll be surprised with the much it can actually offer. It has a vast variety of color and typography options — you’ll never miss the opportunity to show off your fun personality! 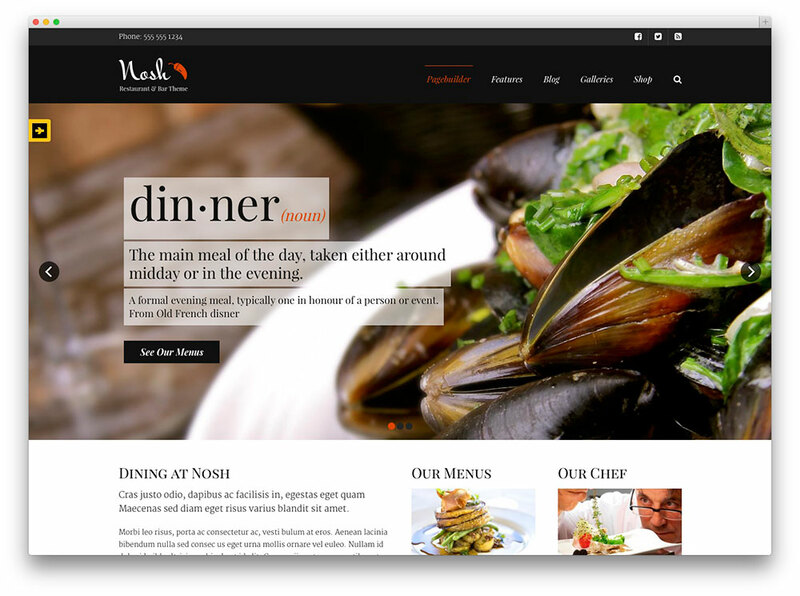 If you’re a gourmet restaurant owner who’s looking for a theme that can give your blog a neat and classy feel, Munch could be the best one out there for you. Menu integration will be a breeze, plus it’s fully functional so customers on-the-go can still check out your menu without breaking a sweat. There’s also never a shortage of theme options, Google fonts, and easy-to-adjust default templates. Restaurant and/or bar owners benefit greatly from a simple, smart, and no-fuss theme like Nosh. Its simplicity allows better user experience with easy access to menu, without sacrificing aesthetics. There’s a myriad of font options, customizable colors, and a ton of gallery styles. 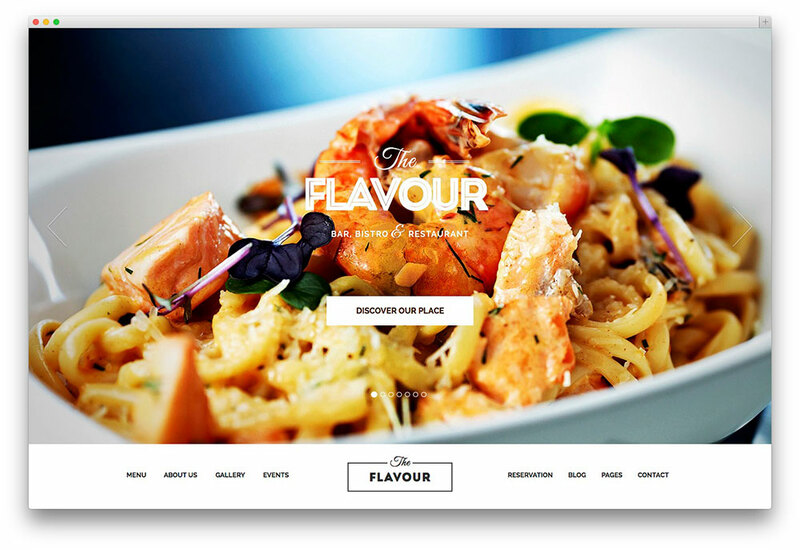 It’s the best theme for people who want to run a restaurant site that’s easy but also offers a number of options when it comes to style and functionality. 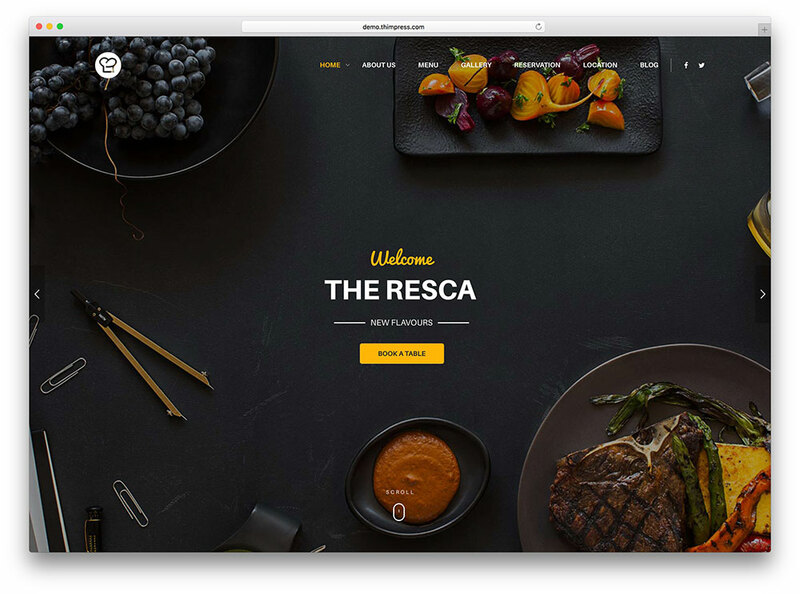 A solid, gorgeous theme for restaurants and cafes that provides a number of options for webmasters who wish to include their menu, pricing, product information, and photos, The Resca is a great choice of theme for sites that cater to a wide audience. There’s even an option that allows web visitors to make reservations or bookings in a flash! If you’re after giving your audience full online customer service, The Resca more than just makes the cut. Do you wish to host a foodie page that does not only furnish readers with fresh and exciting recipes, but also allows them to share and swap recipes online? 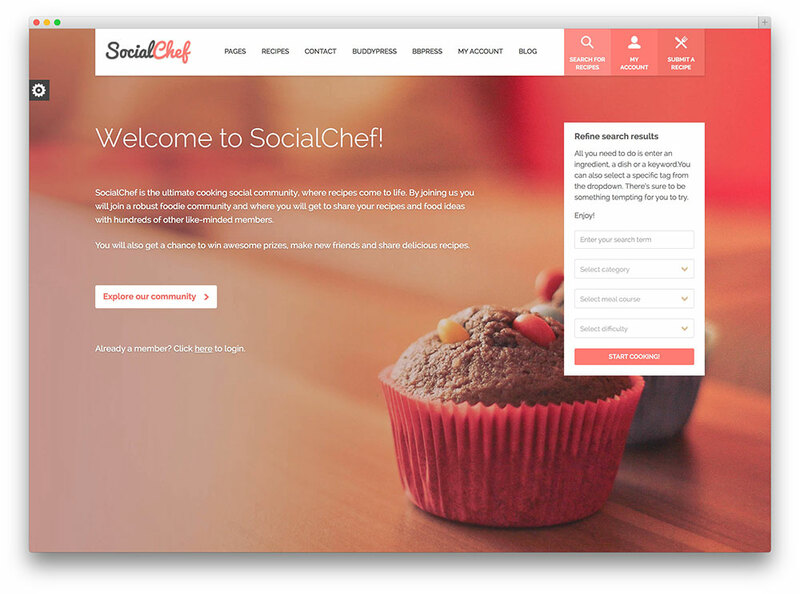 SocialChef offers this one-of-a-kind feature! What makes it even better is that since this theme is fully responsive, it can be viewed without hassle across all devices: mobile or desktop. Talk about a great way to unite all the foodies and make the world a yummier place! Restaurants don’t just offer food, they offer experience. When you want to serve good food, you have to completely satisfy the demands of all the senses in order to create a holistically unforgettable culinary experience. 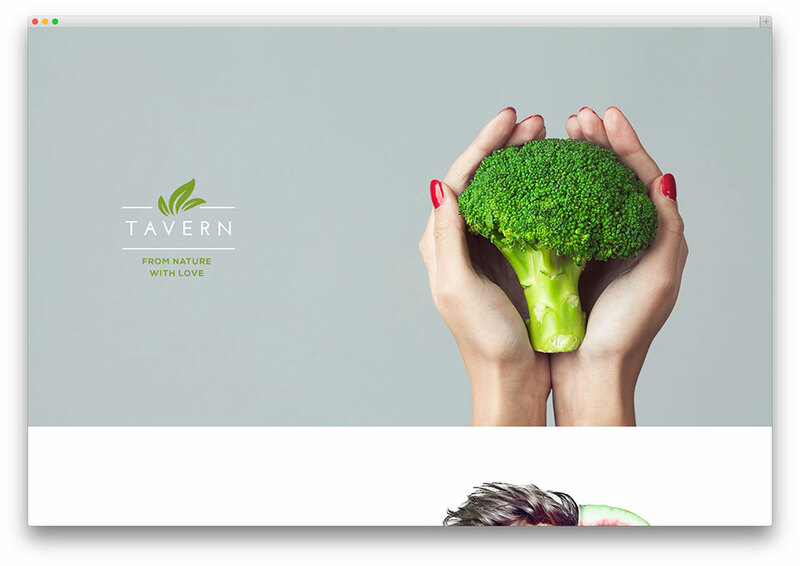 And the people behind Tavern understand exactly that.This WordPress theme offers a smart, sleek, clean, and quality experience that is expected of all food and beverage providers. When it comes to food, it’s always about… the flavour. As for this WordPress theme, it’s all about the tons of features that can be enjoyed — food and drinks menu, reservations page, events calendar, maps and locations finder, and photo gallery. 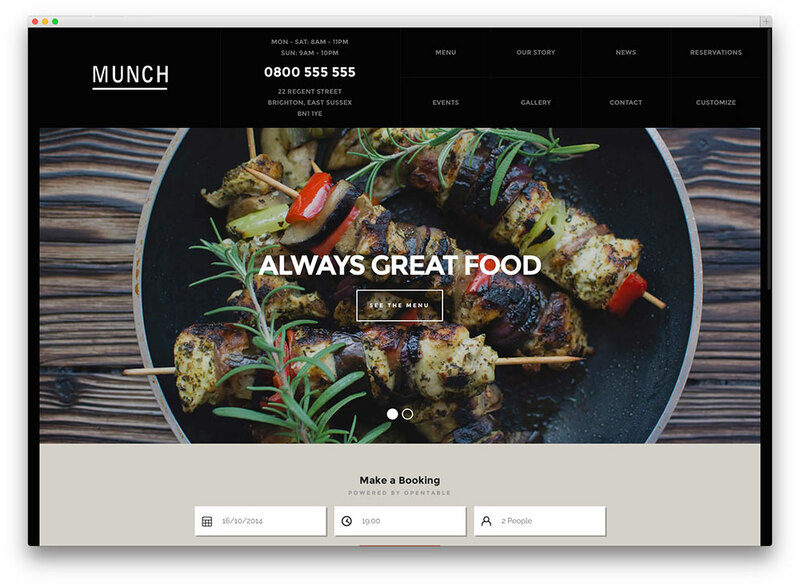 It also has an excellently designed custom page layout that comes with a uniquely fun slider through which you can showcase your sumptuous dishes.